Skookumchuck is an Indian word meaning meeting of the big waters and it is here that the Lussier and Skookumchuck Rivers flow into the beautiful Kootenay River. A familiar landmark The Wooden Indian has stood over this place for many years. Lussier Hot Springs is located at the entrance to Whiteswan Provincial Park access off Highway 93/95 between Skookumchuck and Canal Flats. Ram Creek Hot Springs is located East of Premier Lake Provincial Park with access off Highway 93/95 east of Skookumchuck. 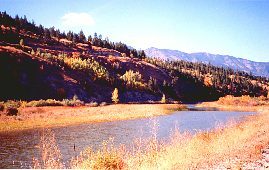 Canal Flats is found in the British Columbia Rockies on Highway 93/95 41 km ( 25 miles) north of the junction with Highway 95A from Kimberley. 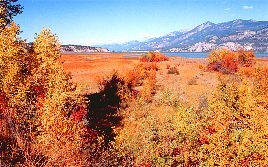 It is situated on a narrow strip of land separating Columbia Lake (headwaters of the northward flowing Columbia River) from the southward-flowing Kootenay River. The area was first visited by European explorer David Thompson in 1807. Highway 93/95 crosses the Columbia River 24 km (11 miles) north of Canal Flats. The healing powers of these hot springs have been used by the Kootenay First Nations people for many, many years. This is a beautiful location with the Rockies to the east and the Purcells to the west. Once a stagecoach stop and mecca for the rich and famous during the late 19th century,this is now home to Canada's largest hot pools. From here you can enjoy heli-sight seeing, hiking, biking, fishing and golfing. Located just beyond Windermere, this tourist area offers unique shops and a full facilities. The region's first trading post, Kootenae House, was built near here by David Thompson and his exploration party. Highways 93 and 95 separate here at Radium Hot Springs. Highway 93 leads northeast to Kootenay National Park and Banff National Park and Highway 95 continues onward to Golden. The springs are named for their relatively high radioactivity. The hot and cool outdoor pools are open year-round. From Radium Highway 95 continues north along the Columbia River through marshland where more than 170 species of birds have been recorded. 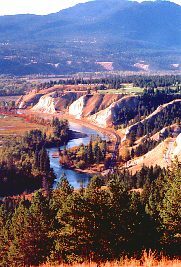 It is also home to various aquatic animals; elk and deer flourish here, along with smaller herds of bighorn sheep, moose, black bear and cougar. Follow the Brisco Road west to the Columbia Wildlife Area and the Bugaboos. From here Highway 95 will take you to Golden. This is where the highway joins the Trans Canada Highway (Highway 1) and travels east to Yoho and Banff National Parks. 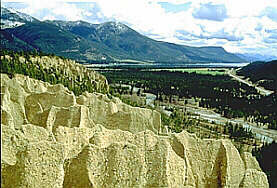 Golden is situated at the mouth of the Kicking Horse River where it meets the Columbia. The area surrounding offers excellent mountain climbing, hand-gliding, heli-skiing and river-rafting opportunities. Follow the TransCanada Highway east from Golden to the stunning Yoho National Park, the Spiral Tunnel, Emerald Lake and its natural bridge. Access to the Takakkaw Falls (2nd highest in the country) is via the Yoho Valley Road.